I found this recipe at Eclectic Whatnot and it looked so simple I just had to give it a try. I was skeptical that these would really taste like a Three Musketeers bar, but they came awfully close. And the longer these sat in the refrigerator, the more they tasted like the real thing. The original recipe suggested dipping these in chocolate almond bark or candy coating, which would probably set up better than the melted chocolate chips, but that stuff is a bit too sweet for me. I had to put mine in the refrigerator to get them to set up completely, but that’s where I ended up storing them anyway, so it worked out just fine. I used semi-sweet chocolate chips for the filling and milk chocolate for dipping, but feel free to use whatever combination of chocolate you like. I used a toothpick to hold my nougat centers for dipping, and a spoon to help get the chocolate over the top and sides. These really were easy, and I rarely say that about a candy recipe. I’d definitely make them again, and probably will very soon! Line an 8 or 9-inch square pan with wax paper. In a medium bowl, melt 2 cups of chocolate chips in the microwave at fifty percent power, or use a double boiler. Using an electric mixer on high speed, beat melted chocolate for about 30 seconds. Add whipped topping to melted chocolate and beat until well combined and fluffy, 30-60 seconds more. Spread chocolate mixture evenly into prepared pan (if mixture is too stiff, press into pan with lightly dampened hands). Place in freezer for 30 minutes. Remove pan from freezer and turn chocolate mixture onto a cutting board; cut into one-inch squares. Return squares to freezer for another 15-20 minutes. Meanwhile, melt remaining 2 cups chocolate chips with 2 tablespoons of vegetable oil and stir until well combined. Dip frozen chocolate squares into melted chocolate to coat. Place on wax paper to set. Keep chocolates in an airtight container in the refrigerator. Who Dished It Up First: Adapted from Eclectic Whatnot, who found the recipe at The Open Pantry. Genius! 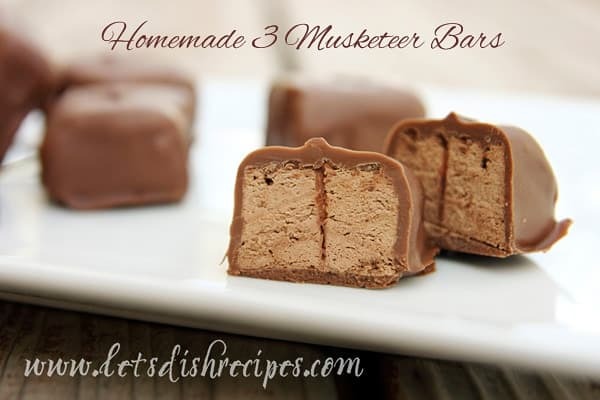 I love 3 Musketeers.. what would you think about a little caramel too?? I’m surprised there are so few ingredients too! You’ve got to give me some photography tips…your photos are amazing! But where’s the nougat?! And store-bought whipped topping? Hmmm. I’m surprised, too. I actually tried to make these type of bars before but with actual nougat, but it didn’t workout perfectly b/c I was too lazy haha. Your photo is absolutely perfect. Wow. Oh yum…these look wonderful. And I agree, your photographs are amazing! YUM!! These look great and so simple to make!! My son walked into the room as I pulled your photo up and his jaw nearly hit the floor. This is a candy bar he loves and we’ve just bookmarked the recipe to try this week. Thanks! So happy to have found your blog. what wonderful recipes! Enjoyed going through your posts! The kids are going to love making these! Oh those look soooo good!! I’m absolutely making them this weekend…or right now! Oh wow! I’m definitely giving this a try! Came back to let you know that I’m featuring you this week for Friday Favorites! These look sooo good! Thank you so much for sharing!! !I’m Barb….I am from Finding Fabulous. I am your newest follower. I hope you will get a chance to visit my blog @ santasgiftshoppe.blogspot.com & get inspired by something for your family/home. I hope you will take a peek and follow me as well. Nice to meet ya new friend!! !Plus I have a great Italian Stone Giveaway going on right now..We’d love to have you join us. Ohhhh….fun!!! Must try 🙂 I love easy candy recipes. Might have to add this to the Christmas platter. Had to come back to comment again after we made these. Actually, my 11-year-old made them and they turned out great. We love them straight out of the freezer. So fun and simple. Glad you shared it! I must be stupid, but I’m not sure how the science behind this works….mixing melted chocolate with whipped cream MELTS the cream and I didn’t end up with anything close to fluffy chocolate. Ahh! Not sure how you all did this, but this process has always been a bust for me, this time included. Any suggestions? I now want to conquer this method! Karla, I’m really not sure why that’s happening. You might try letting the chocolate cool slighty, but I find it cools enough by the time I transfer it to my mixing bowl and beat it for a minute. Maybe if you are leaving the chocolate in the same bowl you melted it in, that would be too hot? The only other thing I can think of is if you were using real whipped cream instead of the Cool Whip. I’m not sure of the science there either, but maybe the fake stuff holds up better than the real stuff? Karla, you could also try adding the whipped cream gradually instead of all at once (unless you were already doing that). I just tried making these today.. I had a difficult time as well. I used Cool Whip as per ingredients. in for the 30 minutes and actually put them back in to harden them some more but, it didn’t work. at another time. Maybe I’ll have better luck next time. The recipe says 4 cups of chocolate, divided. Then it goes on to say use 2 cups of additional chocolate chips. Here is where I am con fused. I don’t want to make this & have to throw it out. This recipe sounds hookie to me. It means the 2 additional cups of chips after you melt the first 2 cups in step 2. I will change it to say 2 remaining cups so it won’t be confusing. It is 4 cups total. I used a double boiler and put the redi whip topping into the double boiler after I removed it from heat. After freezing for abt an hour, it came out just like chocolate fudge in consistency, rather than a whipped nougat. 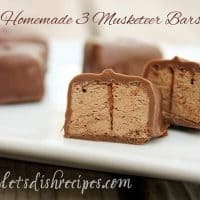 Not much like a three musketsteer bar, but ok for a fudge recipe. I am not sure how well it will remain a solid, once it is moved to the fridge, though. But I have the intellect of a college Professor.